The one thing that pilots can never defend against is a bird strike. You plan for them, trying to figure out what you're going to do when one happens. And that is (1) to try to avoid a direct hit in your face, and (2) fly what remains of your airplane to a safe landing ASAP. On occasion, you will hear ATIS warn of "caution, birds in the vicinity of the airport", or something that raises your consciousness level about avoiding birds to a higher level. If you are departing, you try and get through the first 1,000 feet AGL without making contact with Tweety Grande. If you are on final, you keep focused in the numbers, knowing that a strike close to the ground at approach speeds means you have very little room to let control of the plane slip away. As I prepped for Thanksgiving, I realized I had a couple of hours at dusk to hit EUG and practice a couple of landing procedures in 27W. As I pre-flighted in the hangar, I had the scanner glued to ATIS, which warned of "birds in the vicinity of the airport." I cruised to the run-up box and then departed 34L with a mid-runway intersection takeoff. The controller asked if I preferred moving to the east side of the field to use 34R for my touch and go's, which I accepted. I slipped into a nice smooth right downwind, the 235 settling into the perfect 500 FPM descent. That was about the last time this approach felt normal. As I turned base to final for my first practice landing, the controller came on and told me something that I swear is true...you can listen to the ATC tapes if you want. 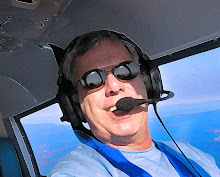 He told me, and I quote..."Cherokee 8527W, caution – I have returns, uh, it looks like a flock of maybe FIVE THOUSAND GEESE moving east to west across the north end of 34R at about 300 feet AGL. Are you SURE you want to do a touch and go right now?" Now I promise you, hearing that there are five grand worth of flying objects in my direct path, any one of which can cause possible catastrophic damage to my plane, well that really got my attention! So I called for a full stop, and as I passed through 300 AGL, I might have dug fingernail grooves in the yoke. 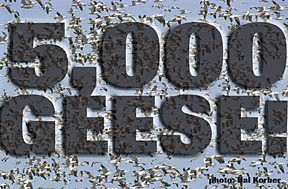 See, I had NO FRICKIN' IDEA how much actual airspace five thousand geese takes up, but I was pretty sure that a few of the stragglers with bad nav systems might have drifted south of the westbound pack, and could have very well been over the approach end of 34R – right where I was. So I braced for impact, mentally thinking about ducking when Tweety Grande meets my windscreen. It was the crapiest approach and landing yet in my new 235, but in many ways, when I touched down with a thud and realized I still had my life and my airplane in one piece, the landing felt like a greaser from heaven. It's always nice to know Papa Louie has my back. I'm writing this stuffed to the brim after Thanksgiving dinner, and I have to say, birds look best when laid out on the dinner table between candied yams and cranberry sauce, not lollygagging along near my airport.